☸【Pull Back】- - push back the car toy in a little distance, then let it go, the car can go by itself. Great to enjoy family holiday time. 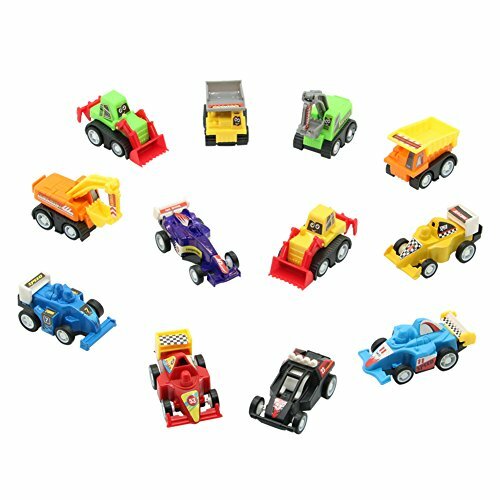 ☸【All in different style】- - these toys car set includes12 packs - 6 construction vehicles & 6 racing cars, all are in different shapes and bright color. Meet kids need. ☸【Mini car】- - They are small, with cute stickers and each of them has moving and flexible parts. Car lover will fancy them as a holiday toy kit. ☸【Assorted truck】- - Enhance children to cognitive different cars / vehicles through play. Pull back cars can get across the floor very fast. ☸【High quality】- - Measure approx 2.4 inch, made of environmental friendly non-toxic plastic, safe, durable, and lightweight. Recommend for boys girls3 -6 years old.